There were three new fires discovered Friday in the BLM Alaska Fire Service (BLM AFS) Tanana fire management zone. All three were lightning-caused fires from thunderstorms this past week. 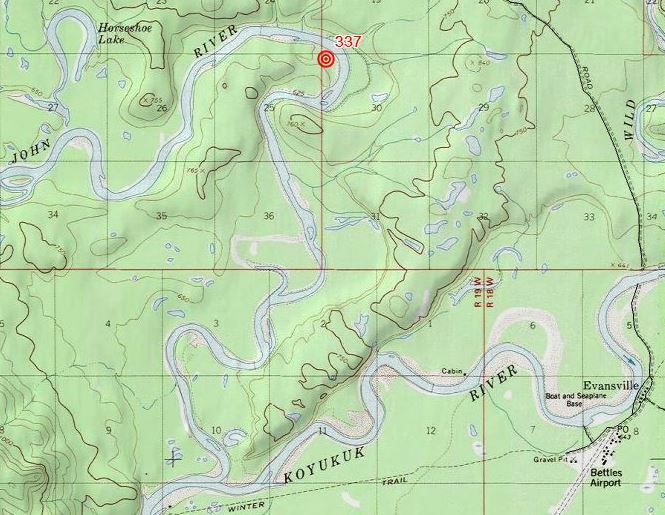 The John River Fire (#337) was originally reported by private aircraft as 100 yards across and burning off of a gravel bar along the John River, 4-miles northwest of Bettles. The area fell within a full suppression area and Jumpship-21 was dispatched. Over the fire, J-21 reported the fire at 1 acre with a 40 percent active perimeter, smoldering and creeping in black spruce and tundra. The decision was made to deploy four BLM Smokejumpers onto the fire. At last report the fire was sized up at 3.6 acres and had been contained by the firefighters. They will work today extinguishing hot spots and mopping up the perimeter. The other two new fires in the Tanana Zone were detected by satellite imaging and confirmed by aerial reconnaissance. They are located in limited suppression areas and will be left to proceed in their natural ecological role. The Chleca Lakes Fire (#338) was reported to be 250-acres with a 100 percent active perimeter, backing with isolated torching in black spruce. It is located 32-miles southwest of Lake Minchumina. The Nowitna Fire (#336) was reported to be 1,500 acres with a 100 percent active perimeter, backing, running, torching, and spotting in a spruce and hardwood mix. It is located 48-miles southeast of Ruby. These fires are not threatening any known sites of value and will be monitored by zone surveillance aircraft. The fire season has been light in the Tanana fire management zone that roughly covers an area from the Colville River on the North Slope, south through Ruby to Denali National Park and Preserve, and east to the Dalton Highway. There have only been 13 fires this season with the John River Fire being the second one to be staffed with any personnel. Currently there are 62 active fires in Alaska. Year-to-date in the state there have been 298 fires burning 412,484 acres.